Courtesy of Havianas via Instagram. Early summer has come and gone, mid-summer is passing us by, and we’re officially in the late-summer "When Will This End?!" phase. Heatwaves are rolling across the world and big folks everywhere are wondering how to stay cool and have fun despite the heat! At AllGo HQ, we reached peak temperatures last week and finally turned some of our Amazon Wish List items into actual purchases. Here are a few of our comfort-forward faves and a few items we're still coveting. Full Disclosure: If you click on any of these items and purchase them, AllGo will receive a very small commission on the sale. Havaianas are truly the best rubber sandals in the world. I consider these one of the BEST summer items! 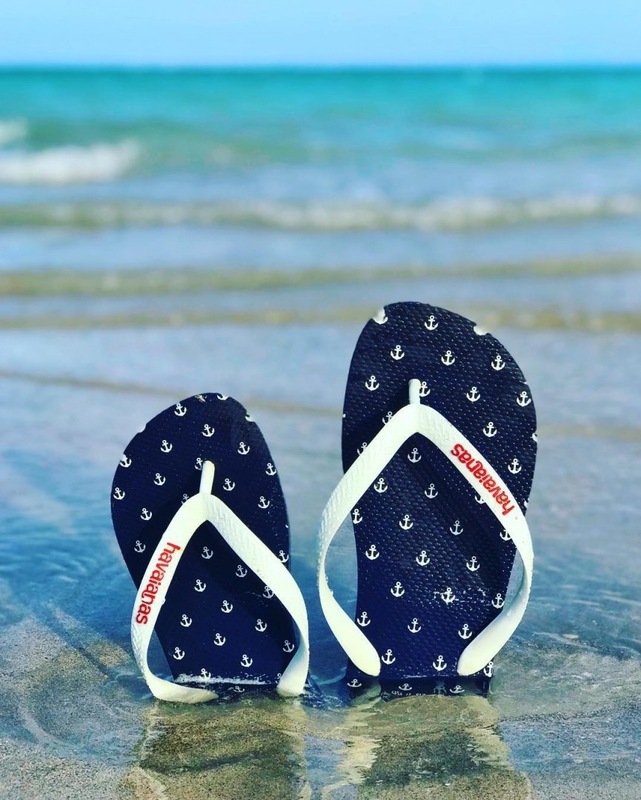 The ultra-high quality of Havaianas is due to a top secret rubber recipe that makes the sandals soft as marshmallows, light and highly durable. They are firm and support my weight perfectly. Great for wide feet, too! This inflatable lounge is guaranteed to be your new best friend at the pool or beach! It can hold up to about 500 pounds so it’s perfect for plus size people to look adorable on. If you’re looking for cute and comfortable, this steed is for you! We’re scoring BIG this summer with another item that holds up to 500 pounds.. This one is superwide, which is my favorite! This Caravan Sports Zero Gravity Chair Loveseat can be set up anywhere. Even my plus size friends and family with limited range of motion or limited core strength say they like these zero gravity chairs. You can take this loveseat anywhere - your friend’s backyard for a cookout, that park concert you’ve been meaning to chekout, or the beach! YES! Rebecca and Lucy (Rebecca’s fabulous dog) like to work from the park in the summer. The airflow from this mini fan is amazing for keeping cool! The neck is flexible and the fan speed is adjustable. We highly recommend this fan for everyone regardless of size! One of these anti-chafing sticks is a must for summer work or fun! Megababe is the luxury anti-chafing product you never knew you needed. It’s a great option for supporting a small, woman-owned business if you can. ChafeZone for ChubRub is a little more affordable if you’re on a budget. They both work great! If you’re into sundresses and skirts for hot weather, make sure you take a gander at Undersummers. They’re another anti-chafing option if you prefer or need to avoid products on your skin. The Fusion style of shorts go to 5X and are perfect under dresses, skirts, and even rompers if you’re anxious about chafing. So comfortable to wear and with a cotton lining they can replace your other undies so you’re not adding too many layers of cloth! This portable beverage chest is great for any outdoor occasion. And it has two great features: 1) It's on wheels & 2) It's table-height. For those of us with back issues, the last thing we need is to do it be carrying a chest everywhere, bending over every time we'd like a blueberry lemonade-flavored Polar seltzer. If you plan to enjoy the summer with friends and family this is the perfect portable chest for any occasion. All you have to do is add your favorite drinks and you’re ready to go! Just stay cool! & if staying cool is the plan than you’re going to need this cold compress therapy wrap. The best part about it is that it actually covers than the entire neck and it is reusable. If you have a big neck, you’ll need a big ice pack. Whether you’re using ice for icy drinks or to stuff your cooler, these soft silicone ice cube trays are a perfect addition. What we love about these is you don’t have to break the ice cubes. You simply push them up from the bottom. They’re so easy to use and the ice comes out perfectly. These are also dishwasher safe! There’s no way this would of been a complete list without a great bluetooth stereo. Why is this a good summer item you ask? Well a pool party isn’t complete without good music! Plus you can put any fear away about water damage because it’s also waterproof. This is a perfect stereo to add to your fun days in the sun! These Artisan Hammered Moscow Mule Copper Mugs come as a set of 2 with straws. I love these because they’re round like me and I also love stuff that makes me feel fancy. Ever heard of matching your fancy cups to your body shape? You have now! We love these items! Don’t be shy and after you buy all this stuff, post pictures with your new items and tag #CanWeAllGo!